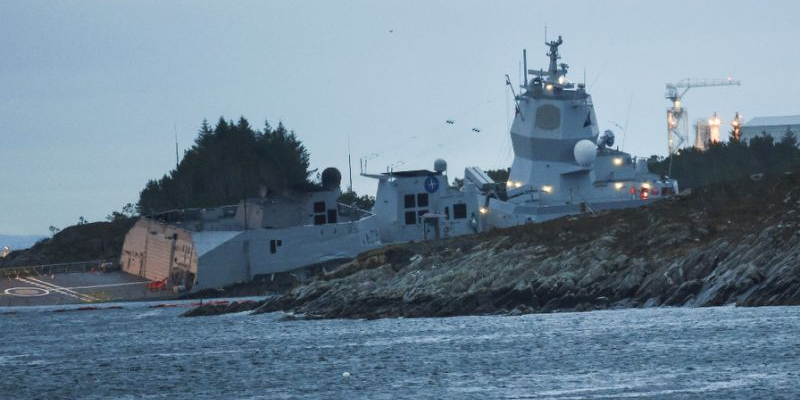 An operation was underway Thursday to try to stop a Norwegian navy frigate from sinking after it collided with a Maltese oil tanker in a fjord in western Norway. The 137 people on board the KNM Helge Ingstad frigate, which was returning from NATO’s Trident Juncture exercises, have been evacuated after the collision with the Sola TS tanker, the army said. “It took on a lot of water and there is a real danger that it sinks where it is,” an official for the Sola rescue centre told AFP. According to the Norwegian Coastal Administration, a 10-cubic metre helicopter fuel tank on the frigate was ruptured. Built in 2009, the KNM Helge Ingstad participated in chemical disarmament operations in Syria between December 2013 and May 2014.